intermediate | Let's Learn Hungarian! 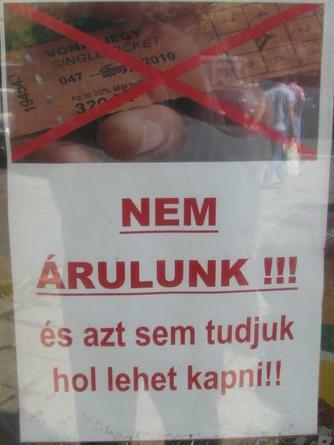 Intermediate Hungarian: what does this billboard say? November 8, 2014 By Let's Learn Hungarian! I took this picture of a billboard in Budapest. What does the text say? Vote below! 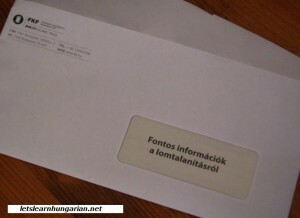 Hungarian intermediate lesson: what is this message? The photo is of a hand holding a public transportation ticket, crossed out. So apparently, they don’t sell public transportation tickets here. Nem árulunk!!! = “We don’t sell (them)”. But what does the statement under that tell us? a) …so don’t even ask!! b) …but you can get them at the store next door!! c) …but maybe we will one day!! Click on “Read More” to see the answer and an explanation!